Judy Garland (born Frances Ethel Gumm; June 10, 1922 – June 22, 1969) was an Oscar-nominated American film actress and singer, best known for her role as Dorothy Gale from The Wizard of Oz. Garland's singing voice had a natural vibrato, which she was able to maintain at an extremely low volume. The effects which she was able to project enabled her to convey a wide range of emotion when she interpreted a song. Garland's parents, Frank Gumm and Ethel Marion Milne met when Gumm became an 'illustrator' at the Parlor Theater in Superior, Wisconsin in 1913; leading the audience in sing-a-longs between films while Milne accompanied him at the piano. The two wed in January 1914 and went on to settle in Grand Rapids, Minnesota where Gumm took over the New Grand, a movie house, while Ethel played piano. They welcomed daughter Mary Jane, or Susie as she would come to be called, on September 24, 1915 and then Dorothy Virginia, or Jimmie, July 4, 1917. When Ethel discovered she was pregnant in late 1921 she attempted to induce a miscarriage numerous times by throwing herself down flights of stairs. When her attempts failed she sent her husband to family friend, Dr. Marc Rabwin, to arrange an illegal abortion. Rabwin, who believed Ethel's desire to not have another child stemmed from rumors of Gumm's homosexuality, convinced the couple that they would never regret having another child. So, Frank and Ethel awaited the birth of their third child who they hoped would be a boy, Frank Jr. But, on June 10, 1922, their third daughter arrived. Named for both her parents and baptized at the local Episcopal church, "Baby" (as Frances was affectionately called) shared the family's flair for song and dance. "Baby" Gumm made her debut at two-and-a-half, joining her sisters in a Christmas performance at the New Grand on December 26, 1924. Singing "Jingle Bells" as her mother played piano in the pit, "Baby" Gumm became so enthralled at the audiences applause she repeated the song five times with the crowd encouraging her, before her father finally carried her off the stage. "Baby" and her sisters continued to make occasional appearances at the New Grand before a family vacation to California in June 1926 resulted in a permanent move that October. While Ethel referenced the temperate climate as the reason for the move rumors reference that the real cause may have been Gumm's homosexual indiscretions. However, according to the work of a detective hired by the Children's Museum in Grand Rapids (formerly the Judy Garland Museum) found no evidence for such claims. After the move the family was unable to find a home or theater in Los Angeles, their city of choice, and instead moved eighty miles north, to California and purchased the Valley Theatre. But despite the undesirable location the Gumm Sisters still found work, with Ethel driving them to the city for stage and radio work as well as additional training. Their increasing workload, the deteriorating relationship between Ethel and Gumm, and the introduction of 'talkies' (meaning Ethel was no longer needed to accompany films of the piano at the theater) led to Ethel and the three girls taking a house in Los Angeles in 1933. In 1934, the sisters, accompanied by Ethel, began a tour of the Northwest. It was during an unexpected performance at Chicago's Oriental Theatre (the sisters were hired to replace a trio that had been fired) that the family adopted their new name. Actor George Jessel, who was headlining at the theater that week, noticed that the audience laughed when 'The Gumm Sisters' were introduced. Jessel suggested the name Garland, from the name of New York World-Telegram drama critic Robert Garland. The following summer "Baby" would go on to choose the name "Judy," after the popular Hoagy Carmichael song, in an attempt on the part of the thirteen-year-old to shake her nickname. Other rumors regarding the origin of the name include the story developed by MGM's publicity department in which Jessel discovered "Baby" crying under the marquee of the Oriental which advertised "The Glumm Sisters" and decided she was "as pretty as a garland of roses." Yet another rumor was created by Jessel himself who claimed that after sending a garland of flowers to Judith Anderson on the opening of a new play he combined the actresses first name with the garland. In June 1935 the sisters were discovered by Al Rosen at Lake Tahoe's Cal-Neva Lodge. Rosen immediately began working on behalf of Judy attempting to find a studio who would be willing to sign her. However, most of the major studios believed that there were no parts for Judy because of her age. 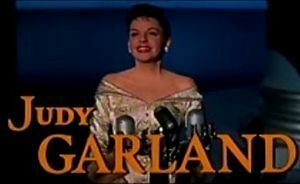 MGM, however, had already shown interest in Judy several months before when writer/producer/director Joseph Mankiewicz had brought her to the studio's attention and filmed a test. While nothing came from the initial test Rosen was able to arrange an interview for Garland in September 1935. After auditioning for Jack Robbins and Ida Koverman the two called Louis B. Mayer himself to come and hear Garland. While his reaction was dispassionate he immediately ordered that contracts be drawn up for Judy to be signed as an actress. Two months after signing her contract with MGM Garland's father suffered a sudden case of spinal meningitis. He was hospitalized November 16th, when Judy was scheduled to make an appearance on the "Shell Chateau" radio program. Judy was instructed to make her performance of "Zing! Went the Strings of My Heart!" especially emotional since Gumm would be listening. However, Gumm passed the following afternoon. Adding to the emotional blow, it was also Ethel's birthday and Gumm had planned a surprise birthday party for his wife. So, that evening, friends from as far away as Grand Rapids arrived at the family's home. Though devastated, Judy threw herself into her work, continuing her studio training and making radio appearances. However, MGM did not give her any substantial film work, announcing several projects but never completing them. Her first film was Pigskin Parade for which MGM loaned her to 20th Century Fox. She then made an appearance in Broadway Melody of 1937. It was not until February 1937 that Garland earned her first big break. Clark Gable had been experiencing a difficult part of his life, being falsely accused of fathering an illegitimate child and then suffering a case of influenza before finally returning to the set of his film February 1, his birthday. The studio planned a surprise party to distract Gable and chose Garland as the entertainment. She had been rehearsing a piece with composer Roger Edens entitled "Dear Mr. Bernie" for a radio performance with orchestra leader Ben Bernie for February 2. When Edens learned of the Garland's scheduled appearance at Gable's party he quickly changed the song to "Dear Mr. Gable" and decided that Garland would also perform the song during her radio appearance. The number was a rousing success and sealed Garland's place with the studio. After a string of minor roles, she landed the leading role of "Dorothy" in the MGM film The Wizard of Oz (1939). Although the original choice for the role there was momentary consideration of both Shirley Temple and Deaana Durbin because of their box office reliability. However, neither had the vocal strength for the role and they were both under contract at other studios. And so filming began on May 9, 1938 with Garland in the leading role. 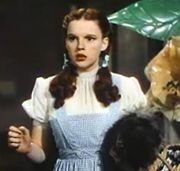 The film would not only prove her greatest movie success, but also provide Garland with her anthem, "Over the Rainbow." It also earned Garland an honorary Academy Awards. After Oz, Garland became one of MGM's most bankable stars, proving particularly popular when teamed with fellow juvenile star Mickey Rooney in a string of backstage musicals. The duo first appeared together in the 1937 B-movie Thoroughbreds Don't Cry. They became a sensation and they teamed up again in Love Finds Andy Hardy, and then soon after in Babes in Arms. Garland eventually would star with Rooney in nine films. To keep up with the frantic pace of making one film after another, Garland, Rooney, and other young performers were constantly given amphetamines, as well as barbiturates, to take before bedtime. In addition to the energy boost the amphetamines provided for working they also served as an appetite suppressant. This was especially helpful to Garland, whom the studio heads often referred to as "the fat one." For Garland, this constant dose of drugs would lead to a lifelong struggle with addiction. Although many would go on to blame Garland's addiction problems on the studio as soon as they realized the effects of the pills they attempted to keep the medication from Garland. However, Garland proved masterful at hiding the medication in her clothing and dressing room. In 1940, Garland starred in three films; Andy Hardy Meets Debutante, Strike up the Band and Little Nellie Kelly, Little Nellie Kelly featured Garland in her first adult role, casting her as both daughter and mother. The project was purchased from George M. Cohan as a vehicle for Garland to assess both her audience appeal and her physical appearance. The role was a challenge for the young actress requiring the use of an accent, her first adult kiss and her first (and subsequently, only) death scene. The success of these three films–and a further three films in 1941– secured her position at MGM as a major property. It was also in 1941 that Garland created her first scandal by eloping with musician David Rose in Las Vegas during the filming of Babes of Broadway, a sequel to Babes in Arms. Most believed that Garland's marriage to Rose was an attempt to escape the control of her mother. However, Rose, ten years Garland's senior, failed to provide the support Garland had hoped. When she became pregnant both the studio and Ethel wanted her to terminate the pregnancy so she could continue working. When Garland turned to Rose to protect both her and her child he failed to do so, telling her to have an abortion. In 1942, noticeably thinner, Garland was given the lead role in For Me and My Gal alongside Gene Kelly in his first screen appearance. She was top billed over the credits for the first time and effectively made the direct transition from teenage star to an adult actress. It wasn't until 1943, at the age of 21, that Garland was finally given the "glamour treatment" in Presenting Lily Mars, in which she was dressed in "grown-up" gowns and her lightened hair was pulled-up in a stylish fashion. Years later when reflecting on her mother's film image, Liza Minnelli stated that in her opinion her mother looked "the most beautiful in this film." However, no matter how glamorous or beautiful she appeared on screen or in photographs, Garland was never confident in her appearance and never escaped the "girl next door" image that had been created for her. In 1944 Garland filmed one of her most successful films, Meet Me in St. Louis. But aside from the film's success, which also provided Garland with her standards "The Trolley Song," "The Boy Next Door," and "Have Yourself a Merry Little Christmas," the film introduced Garland to director Vincente Minnelli. When filming first began Garland was left devastated by Minnelli's technique when he made her perform eleven takes of her first scene. However, when she learned that the repetition was his attempt to make her read the lines as a turn-of-the-century teenager rather than a contemporary satirist Garland's respect for Minnelli soared and eventually transformed to love. In fact, it was Minnelli who specifically requested a new make-up artist for Garland on the set of the film. Dorothy Ponedel refined Judy's appearance in several ways, including extending and reshaping her eyebrows, tweezing her hairline, modifying her lipline and getting rid of the unnecessary nose discs. Judy appreciated the results so much that Ponedel was written into her contract for all her remaining pictures at MGM. Interestingly, MGM's attempts to "glamorize" Garland stopped in 1948, at which time her appearance was natural yet refined. Publicly, Garland stated that she was never quite happy with her appearance on screen except in Meet Me in St. Louis (1944) and The Clock (1945). Garland followed Meet Me in St. Louis with The Clock, another project which paired her with Minnelli. The relationship between the two grew and on June 15, 1945, eleven days after finishing filming The Harvey Girls Minnelli and Garland wed. Their relationship was plagued with the same rumors that had followed Garland's own parents (namely, that Minnelli was a homosexual). However, many of those rumors were temporarily quelled on March 12, 1946 when Garland gave birth to their daughter, Liza Minnelli. Although Garland suffered from a bout of postpartum depression (as she would after the birth of all of her children) she returned to work on the film The Pirate at the end of the year. Upon her return from Riggs in September 1947 Garland began filming Easter Parade. Originally intended to be another vehicle for her and Kelly, a retired Fred Astaire took the role after Kelly shattered his foot during a home volleyball game. The film proved to be a great success, unlike The Pirate which was met with mixed reviews. She then filmed In the Good Old Summertime before beginning her next project, a film version of Annie Get Your Gun. Garland was thrilled at the possibility of playing Annie Oakley, but due to production problems and her own personal health she left the picture and was suspended by MGM. Garland would only make one more picture with MGM, Summer Stock, which also starred Gene Kelly and was a throw back to her earlier films with Mickey Rooney. After the film finished production in spring 1950 Garland made another suicide attempt and was told by her doctors that an eight month respite from work was necessary. However, in an attempt to regain her reputation she agreed to replace a pregnant June Allyson in Royal Wedding. Her plan did not work and after a difficult start in production Garland made another suicide attempt at her home, shaking Minnelli and causing a tabloid sensation. And so on September 29th, 1950 Garland was released, by mutual consent, from her MGM contract. The following year Garland divorced Minnelli and began a new chapter in her career. Unsure of what to do following the end of her relationship with MGM Garland was offered the opportunity to play the London Palladium. Sid Luft, whom she would marry later that year, encouraged her to take the opportunity. The decision led to her to develop her signature performing style and to make Luft her manager. Her reception was staggering and Garland felt better than ever before. Inspired by her London success Luft arranged for Garland to perform at the RKO Palace in New York City. The decision was announced in August and Garland opened there on October 16, 1951. Her performance was a triumph and Garland stayed on at the Palace until mid-February of the following year. She continued her live performances across the country and married Luft on June 8, 1952. They welcomed daughter Lorna Luft that November 21. In 1954, she made a notable cinema comeback for Warner Bros. with A Star Is Born, and was nominated for Best Actress. This film is considered by many critics to be her finest performance. Directed by George Cukor and produced by her husband Sid Luft (through Garland and Luft's Transcona Enterprises), it was a large undertaking in which Garland fully immersed herself. It was also a physically demanding role that had Garland on edge and, for the most part, constantly worried. Despite a promising initial opening with rave reviews distributors became nervous about the length of the film and deleted nearly thirty minutes. For this reason it lost much of its original brilliance and caused box office numbers to drop. For this reason the original multi-picture deal Luft had arranged for Garland was dropped by Warner Brothers. In the run-up to the 27th Academy Awards, Garland was believed to be the most likely winner for Best Actress having already won the Golden Globe. However, she could not attend the ceremony because she had given birth to her son Joseph Luft on March 29, 1955, the day before the Academy Awards. Believing she would be announced as the winner the ceremony's producers sent a television crew to Garland's room with cameras and wires so they could televise Garland's acceptance speech. However, the Oscar went to Grace Kelly for The Country Girl (1954). Many fans hold that Garland was "robbed" of her Oscar, and should have won the award (Groucho Marx sent her a famous telegram after the awards, stating that it was "the biggest robbery since Brinks"). However Garland, though disappointed, said that her son was her Academy Award and took the disappointment in stride. Although she made no other films in the 1950s, Garland's films after A Star Is Born included: Judgment at Nuremberg (1961) (for which she was nominated for Best Actress in a Supporting Role), the animated feature Gay Purr-ee (1962), A Child Is Waiting (1963, co-starring Burt Lancaster), and her final film, I Could Go On Singing (1963, co-starring Dirk Bogarde), which mirrored her own life in the story of a world famous singing star. By the fall of 1959 Garland's slight 4'11 frame carried more than 180 pounds. Discouraged by ineffective attempts at dieting Garland once again turned to medication. Luft, concerned by Garland's deteriorating condition, consulted several doctors who concluded that Garland's weight was caused by water retention and that she was seriously ill. Diagnosed with acute hepatitis Garland was told that because of the physically taxing nature of her performances she would never be able to work again. Judy recovered however and physically felt the strongest she had been. Although Luft searched for other means of supporting the family Garland wanted to perform and they needed the income. She performed live shows in both American and Europe but it was her performance at Carnegie Hall on April 23, 1961 that proved her defining moment. Garland enraptured the crowd which was primarily comprised of celebrities and entertainers. It almost immediately became part of show-business lore and cemented Garland's stature as a performer. The 2-record live recording made of the concert was a best-seller (certified gold), charting for 73 weeks on Billboard (13 weeks at number one), and won five Grammy Awards including Album of the Year and Best Female Vocal of the Year. The album has never been out of print. With the demise of her television series, Garland returned to the stage and made various television appearances. Most notably, she performed at the London Palladium with her then 18-year-old daughter Liza Minnelli in November of 1964. The concert, which was also filmed for British station ITV, was one of Garland's final appearances at the venue. Garland, having divorced Sid Luft, continued to make concert appearances and also appeared on television specials. She made guest appearances on the The Ed Sullivan Show, The Tonight Show, The Hollywood Palace, The Merv Griffin Show (of which she guest-hosted an episode) and many others. However, despite successful concerts throughout the world it was those that went poorly which hurt Garland's reputation. A 1964 tour of Australia was largely disastrous. Although the reviews for the Sydney concert were positive and the audience thrilled with her performance the Melbourne performance went horribly. Awaking with no voice due to a poor heating system in her hotel as well as adjusting to different medication, Garland was left without a voice. She arrived at the arena more than an hour late ended after only twenty minutes and created significant bad press for Garland. She had arrived an hour late for the show and immediately took the stage. However, the audience hadn't been told why she was late and began to heckle her when she arrived. Already fragile Garland sang for only twenty minutes before leaving the stage. While most have blamed the audience's reaction of Garland's drug abuse many Australians also blame the order in which she played the shows. An apparent rivalry between Sydney and Melbourne would have also led to their hostile greeting of Garland for playing Sydney first. Garland also married again, this time to actor Mark Herron on November 14, 1966 during a trip to Las Vegas. However, he quickly divorced her in April 1967 when he learned that he would be responsible for Garland's tax debt if they remained married for more than six months. In the mean time, Garland was signed to appear as "Helen Lawson" in Valley of the Dolls for 20th Century Fox in 1967. The character of "Neely O'Hara" in the book by Jacqueline Susann, and subsequent movie, was rumored to have been based on Garland, though the role in the film was played by Patty Duke. During the filming, Garland missed rehearsals and was fired the next month. She was replaced by Susan Hayward. She did record one song for the film, "I'll Plant My Own Tree," which has never been officially released, although it is available on several bootlegs. There is also surviving footage of her wardrobe tests. Barbara Parkins, one of the film's stars, commented in the 2006 DVD of Valley of the Dolls that she believed Garland was frightened by the thought of actually being the aging star she was supposed to play, and that she "freaked" when she realized the similarities between the storyline and her own life. Returning to the stage, Garland made appearances throughout the country, but the effects of her medication was beginning to become evident. In 1968 Garland left for England where she wed discotheque manager Mickey Deans on March 15, 1969. She then departed on what would be her final tour, making her final two appearances in Malmo and Copenhagen. The shortcomings of Garland's childhood years became more apparent as she struggled to overcome various personal problems, including weight gain, weight loss, and serious drug addiction. She was found dead in the bathroom of her London home by Deans, on June 22, 1969. The stated exact cause of death by coroner Gavin Thursdon was accidental overdose of barbiturates. There was no evidence of alcohol abuse and it was believed that given her history with the drugs it was not a suicide attempt, but rather her inability to know her weakened body's limitations. At Garland's funeral, The Wizard of Oz co-star Ray Bolger commented, "She just plain wore out." Garland is interred in Ferncliff Cemetery, in Hartsdale, New York. Judy Garland's legacy is two-fold. As an Oscar nominated actress and songstress, she performed and sang in the genres which made her a most successful star, from vaudeville and radio to the modern stage. On the other hand, Garland is to be remembered as a performer who needed the adoration of the public and the support of drugs and medications to keep herself within her public role. She never gave up trying. Of Garland's five marriages, the first four ended in divorce. Her children are Liza Minnelli (singer and actress) born March 1946, Lorna Luft (also an acclaimed singer), born November 21, 1952, and Joey Luft (a scenic photographer), born March 29, 1955 in Los Angeles, California. This page was last modified on 13 June 2018, at 15:04.